Stonefield Development has been credited with creating the national blueprint for natural disaster group rebuilding. They were the organizer of the largest group rebuild in California of 81 homes after the 2003 Cedar Fire and had subsequent group rebuilds after, including the 2007 Witch Creek Fire and 2008 Freeway Complex fire, rebuilding over 100 homes. 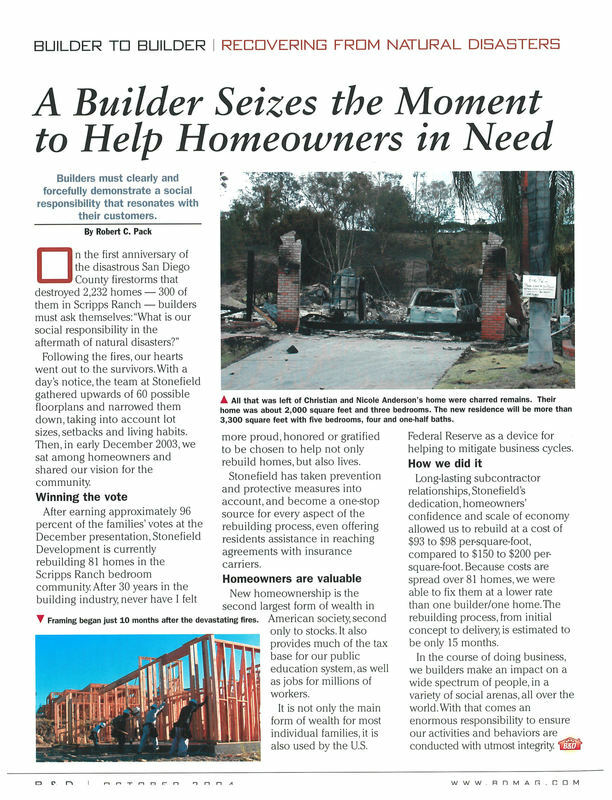 Now, the Stonefield experts are teaming up with local trades in your neighborhood to assist in rebuilding. 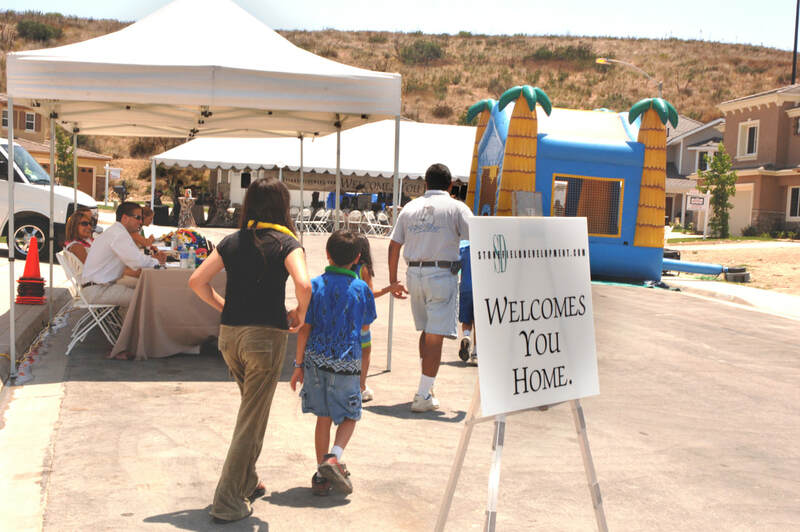 ​We are familiar with working with displaced owners, and we have developed a hands-on strategic plan tailored to get residents back into their new homes in a timely manner. 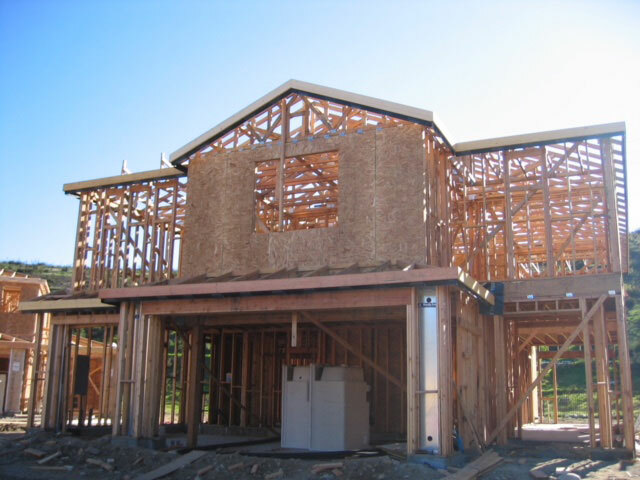 Our extensive experience with fire survivors, insurance companies, architects, engineers, subcontractors and building departments make us a knowledgeable, solution-oriented builder you can trust. ​We are so sorry for your loss. Currently, our rebuild team is organizing ways we can help you and your neighbors on your path back home. 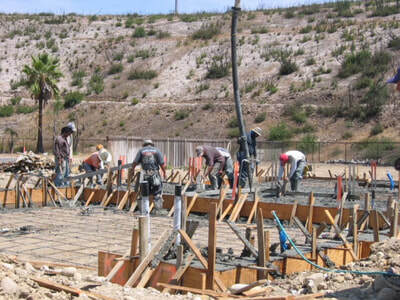 Our large, local Northern California trade networks will allow groups of you to rebuild. 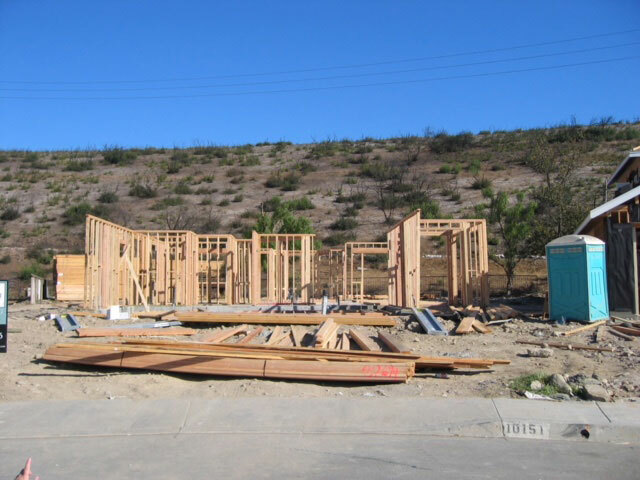 One major component that makes rebuilding different is insurance. 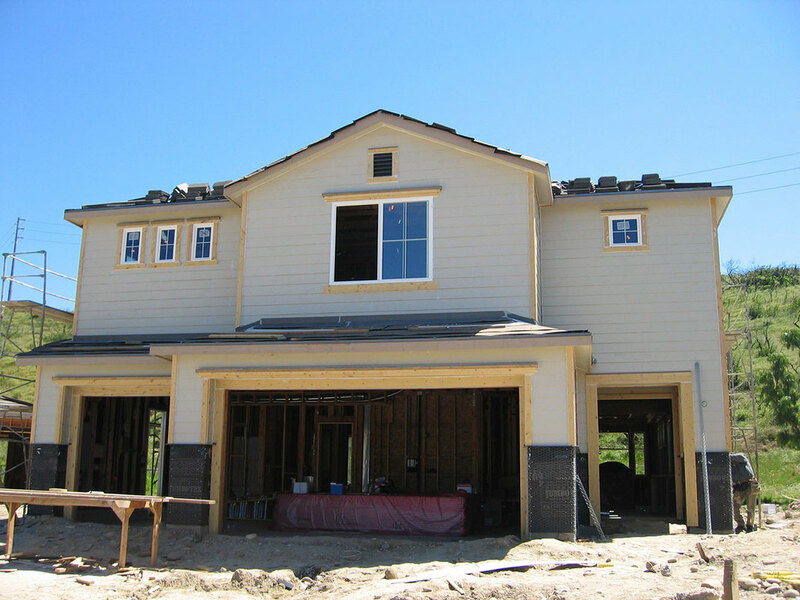 Click here for a list of insurance companies that we have experience working with since 2003. My name is Karen Reimus. 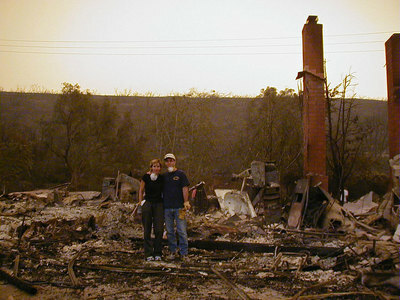 On October 26, 2003, my home in suburban San Diego (as well as 45 others on my street) burned down in the Cedar Fire. In all, my community of Scripps Ranch lost 322 homes in the Fire. If you are reading this letter, then you have, undoubtedly, suffered a similar loss and I am truly sorry. Despite the fact that my home is now rebuilt, I clearly remember the emotional devastation of that difficult time. 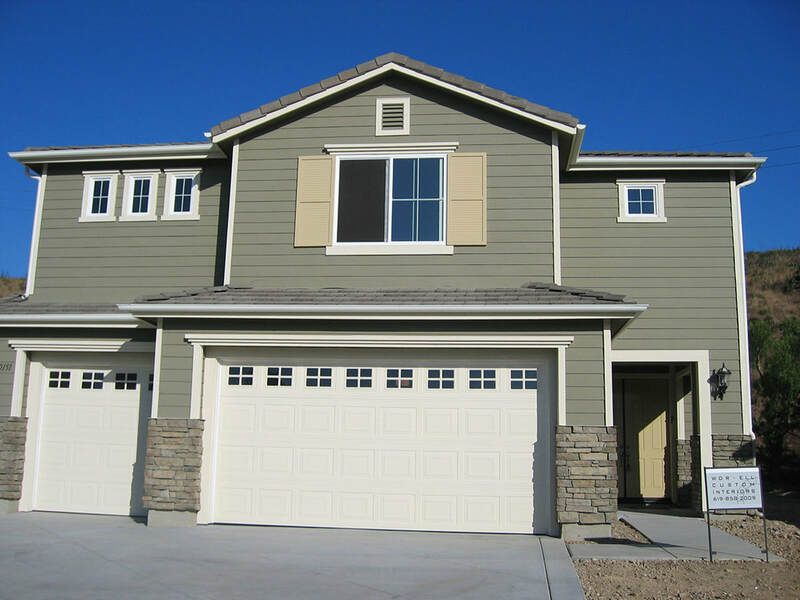 One of the bright spots in my personal recovery process was the experience I had with our builder, Stonefield Companies. 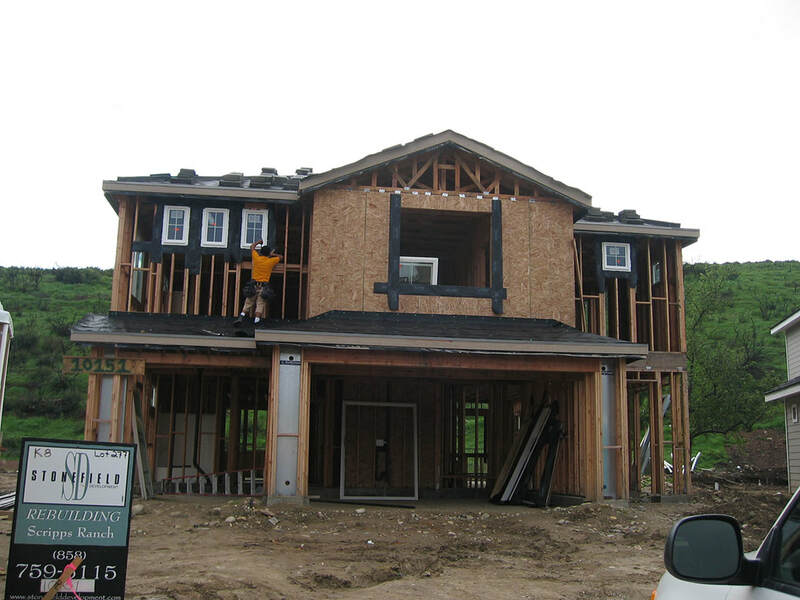 Stonefield’s specialty is constructing custom turn-key homes. 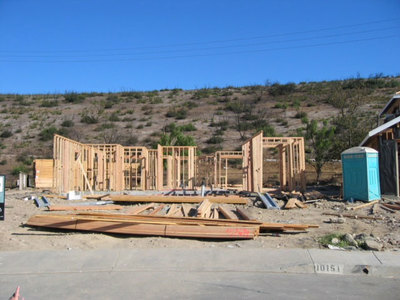 Frankly, I never wanted to build a house. The idea of building a home from the ground up had never appealed to me in the slightest. 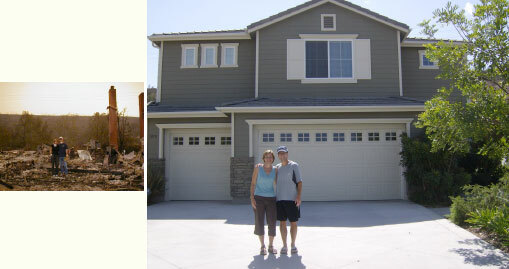 However, after our home was destroyed, I had no alternative but to do exactly that. 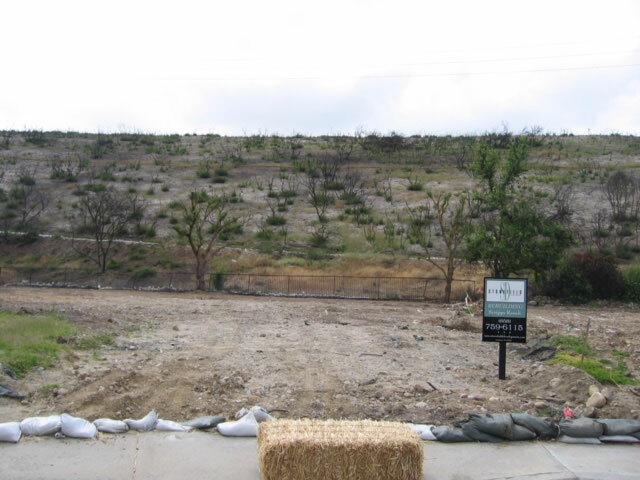 Fortunately, Stonefield made the process as easy as possible for us. 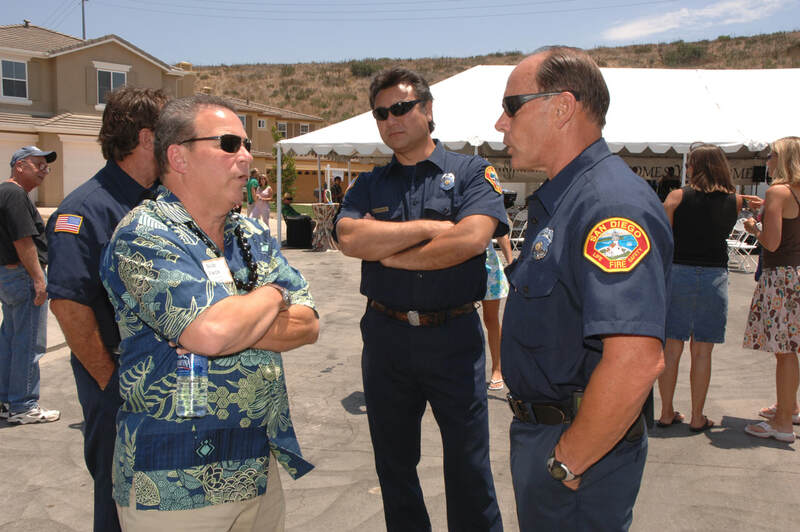 Stonefield is a family-owned business, and as a previous client, I can tell you that it shows in every aspect of how they conduct themselves. We had an honest and open relationship with our project foreman during the entire rebuild process. 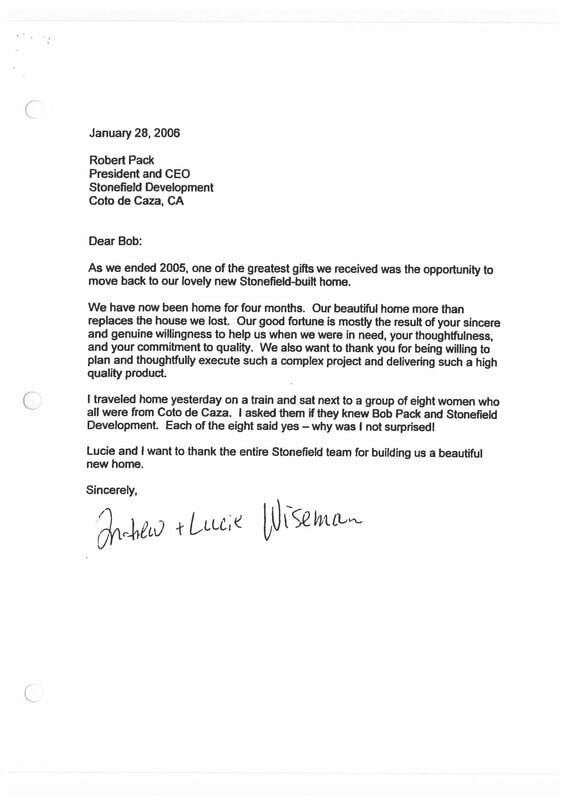 If we had a concern, he addressed it immediately and to our complete satisfaction. In fact, 80 other families in my community elected to hire Stonefield to rebuild their homes. 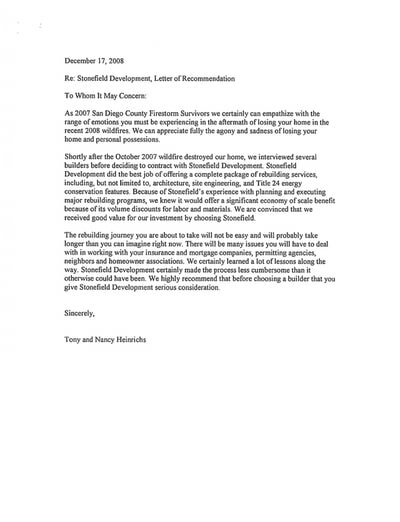 It is difficult to communicate in a short and somewhat impersonal letter, the deep respect and affection my neighbors and I have for our builder, Stonefield Companies. 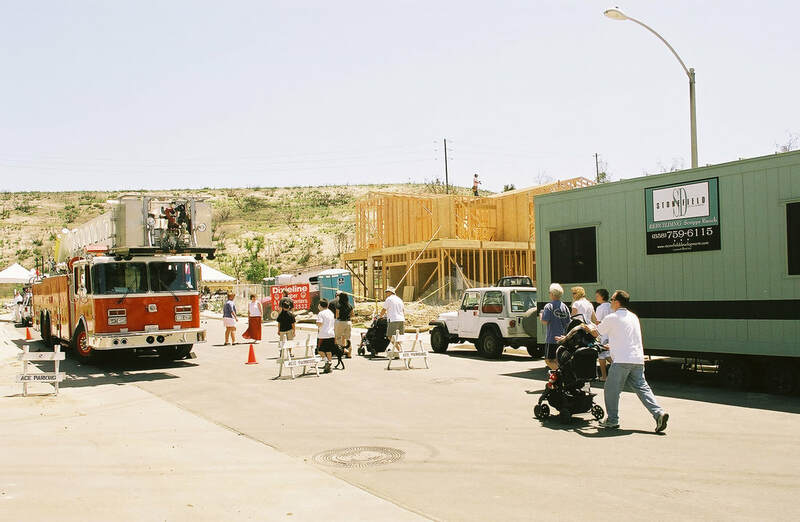 However, our feelings for Stonefield were probably best shown when my neighborhood threw an anniversary party for them on the one-year anniversary of us returning to our rebuilt homes. Most of our homes were completed during 2005. 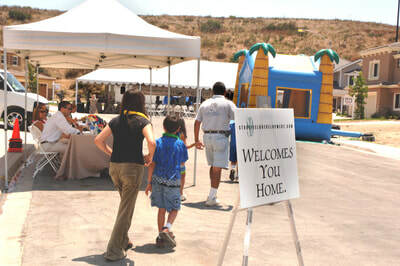 In the summer of 2006, we threw a party for Stonefield Companies, thanking them for returning us to our homes. 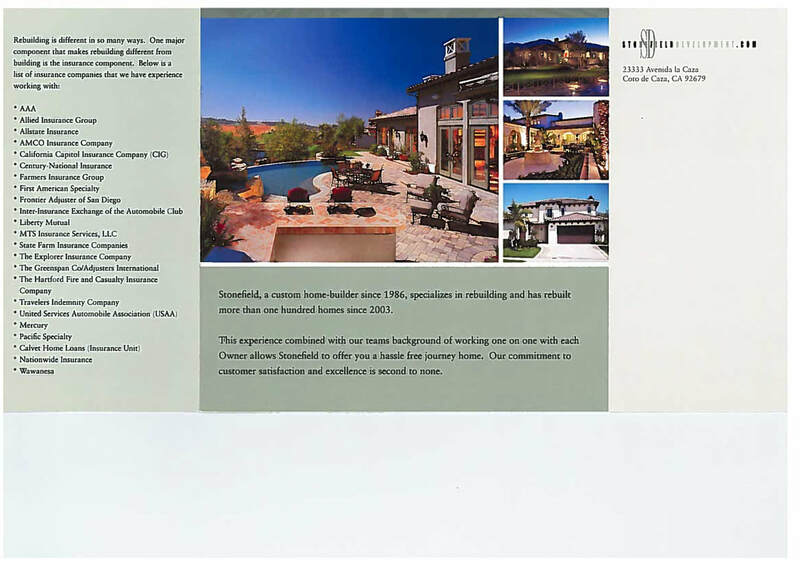 The party included personalized scrapbooks we had created for Stonefield’s President, Bob Pack, and the Project Managers, Patty and Dennis Moser. Recovering from a total and catastrophic loss is a process. From personal experience, I encourage you to investigate every rebuild option at your disposal. 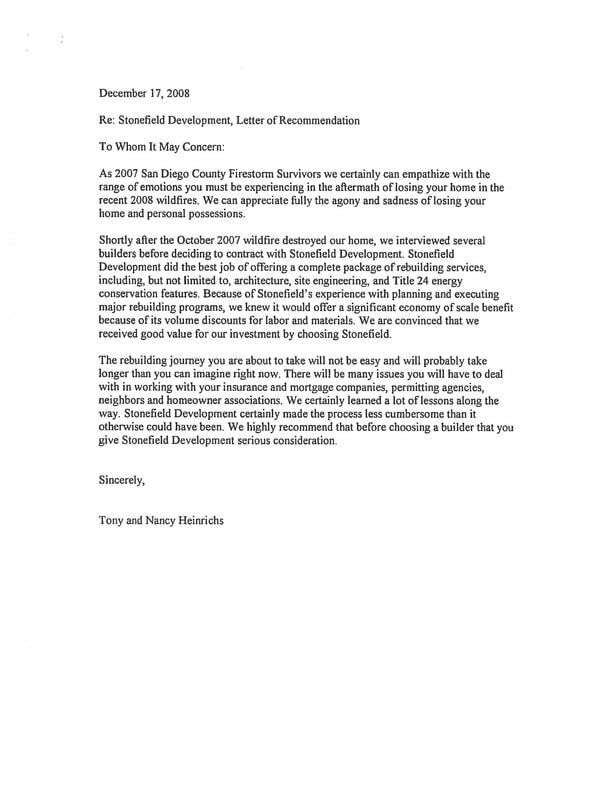 I am privileged to be able to share my very positive experience with Stonefield Companies with you. I wish you the best on your journey of recovery. 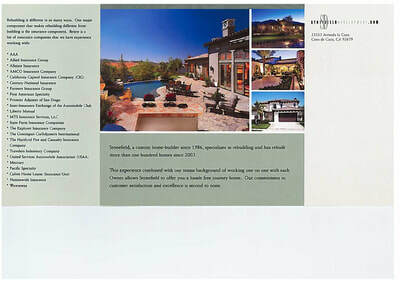 You may contact me at (858) 414-9756 if you have any questions about my experience with Stonefield Companies.